Power. It’s all about the power. And the 2019 Mazda MX-5 has more. And that’s big news on a car that’s already a great performer and a joy to drive. 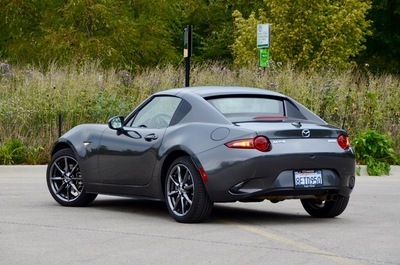 We’ve had fun driving the MX-5 with 155-HP. Now we get 26 more ponies bumping the SKYACTIV-G 2.0-L engine up to 181-HP. Seventeen percent more horsepower is a big move in any engine. There’s also 3 lb-ft more torque to get you moving off the line better and the redline is now up to 7500 rpm from the former 6800 rpm so you can wring that engine out coming down the front straight. This all comes about from a host of internal improvements, including lighter pistons and rods and a larger throttle body. The new engine comes paired to either a standard SKYACTIV-MT 6-speed manual transmission or an available 6-speed automatic transmission with shift paddles and Sport mode. I’ve driven the 2018 155-HP MX-5 both on the track and on the street. Through some fortunate good timing I got some track-time with the new 2019 181-HP MX-5 RF before I even had it on the street. This was around the north circuit at Autobahn Country Club where I did wring out the engine down the straights. This came about through the Midwest Automotive Media Association Fall Rally that brings together auto makers and automotive journalists and provides the opportunity to do some not-everyday track driving. The MX-5 RF also gets some other nice updates. There’s a new, standard tilt/telescoping steering column with 30mm of telescoping and 42mm of tilt range that really helps refine your driving position. There’s a new aluminum steering column to save weight versus the previous steel unit. Also a much-needed standard rearview camera is a big help for us city dwellers. And, the available Traffic Sign Recognition as well as Smart City Brake Support low-speed automatic emergency braking can be optioned. 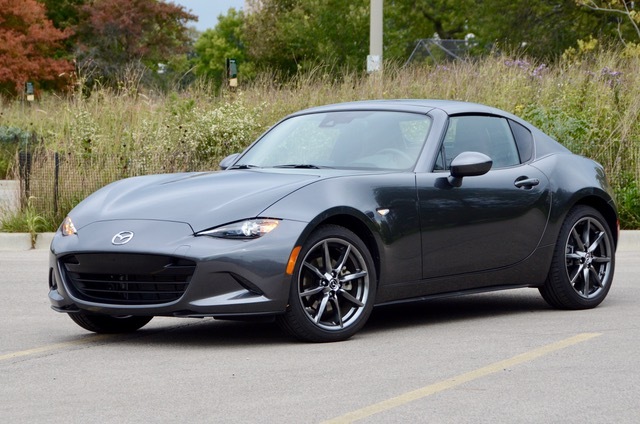 MX-5 RF is still offered in the Grand Touring and Club models. A new GT-S Package for Grand Touring models equipped with the 6-speed manual transmission includes a front shock tower brace, limited-slip rear differential and Bilstein dampers. MX-5 RF models with the GT-S Package will also come equipped with the hand-painted black roof that had previously only been offered in the U.S. on the 2017 MX-5 RF Launch Edition. There are also Brembo/BBS and Brembo/BBS/Recaro packages available, with features just like their names suggest. 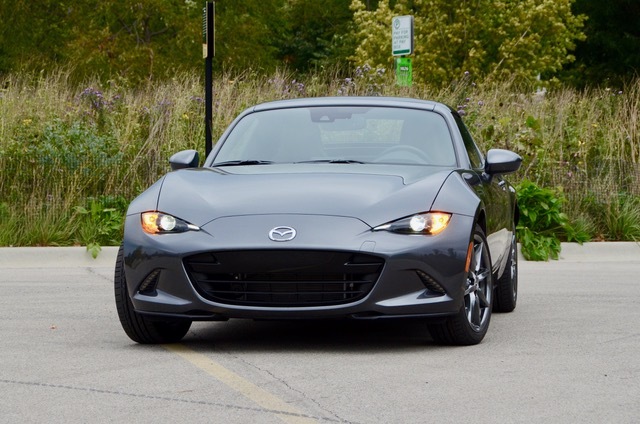 My time with the MX-5 RF was in a Grand Touring model with the 6-speed manual. It’s priced at $33,335. Also fitted was the GT-S package for $750 as well as a $425 Interior package that provided alloy pedals, stainless steel door trim plates and a red engine oil cap. The bottom line hit $36,005 after you include the $600 for Machine Grey paint and Auburn Nappa leather plus the shipping charge. Living in Chicago as I do, makes the RF my MX-5 of choice over the folding soft-top model. Basically, since I would want to enjoy open air driving as much as I could, there is the real need to frequently open and close the top when parked around town. This it does in a mere 13 seconds with the push of a toggle. The RF weighs around 2453 lbs. and with its new found power it’s more responsive than before. It’s much more free revving and the manual shifter is well placed for smooth and easy shifts. EPA test-cycle ratings are 29 mpg combined with 26 city mpg and 34 highway mpg. Low fuel consumption and hitting the EPA numbers is easy to achieve unless of course you’re out there burning up the pavement. The Mazda MX-5 is, well, pure fun. With it’s new found power, light weight, balanced steering and nicely tuned and compliant suspension you really can’t ask for much more. Plus, it’s really affordable. At Autobahn Country Club I tossed it into corners and the car just eats it. Step into the throttle on exit, zoom down a straight then brake smoothly and enter into the next corner with complete composure and confidence. On the road, the clutch has nice take-up and the shifter is butter smooth. There’s a bit more noise then a family sedan but that’s the trade off for open-air driving. 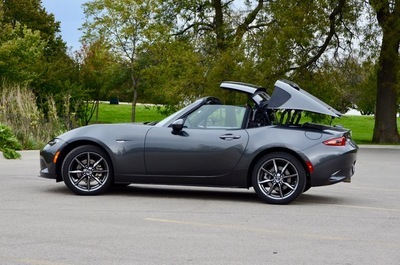 The trunk is a but tight, but roomy enough to hold overnight duffle bags for two. 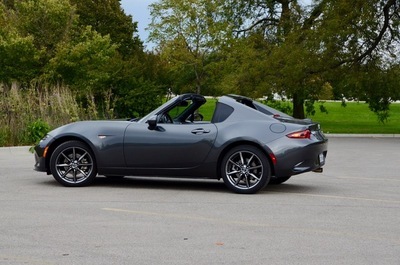 The 2019 Mazda MX-5 is on sale now. Enjoy The Drive. Bring on the open road. LEARN MORE: The Most In-Depth Independent Mazda Consumer Research - Anywhere!